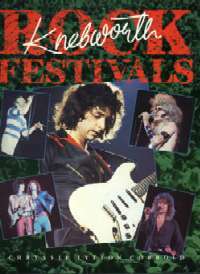 The Knebworth Festival had been running in various forms for a dozen years before Deep Purple headlined in 1985. Possibly the most famous and talked about previous festival would have been 1979 when Led Zeppelin headlined two consecutive weekends, August 4th and 11th.The first night attracted over 120,000 which was more than the licence allowed but try telling that to a bunch of pissed up bikers on the day. The biggest difference compared to 1985, other than crowd size, was the use of a huge video screen at the rear of the stage. Oh, and the weather was better. The first festival, the 'Bucolic Frolic' happened almost exactly eleven years previously on 20 July 1974 when The Allman Brothers Band headlined a varied bill that included the Van Morrison show, the Doobie Brothers and some pumping rock care of the Sensational Alex Harvey Band. Pink Floyd and the Rolling Stones headlined the two following years and after a year off (no big bands were available in '77) the annual event restarted with two events two months apart, Genesis followed by Frank Zappa. Rock turned to pop in 1980 when the Beach Boys headlined a rather more lightweight bill promoted by Capital radio. It lost money so the following year had no concert planned until the Capital Jazz Festival was cancelled and then moved to Knebworth. Jazz continued the following year this time also in conjunction with Chiltern Radio. Things turned religious for the following couple of years when the "atrocious" organisation of the Christian Green Belt Festival ran things. Country singer Charlene headlined the first year while the rather better known Cliff Richard pulled twice the audience in 1982. Unfortunatey the lack of organisation, loud volume and overrunning of the music resulted in the festival not being asked back and in fact no music festival being organised in 1984. With these ups and downs, and the years gap, when Deep Purple played their only UK show of their reunion tour in 1985 the festival was billed as "The Return of the Knebworth Fayre". In these days of Ritchie Blackmore playing renaissance music you have to wonder if he had any input in the name. A consortium headed by Don Murfet (his security firm 'Artist Services' handled stewarding for the earlier Knebworth festivals and provided 300 security staff in 1985 to cover the arena and park) organised the event. Once again a radio station was involved with the event, this time national BBC Radio 1 and the Friday Rock Show in particular. Radio 1 made the most of the festival with the Friday Rock Show the night before the festival (see left) being broadcast live from the site and another live show the following afternoon. For the FRS Ian Gillan risked both the weather and drunk festival goers by going walkabout in the campsite to get the fans eye view. Musically the show followed the bill order with an increasing number of tracks from each band being played between the Gillan segments. Cynics may say the FRS show and Gillan walkabout was a desperate last minute publicity stunt to attract a larger audience. The event was granted a licence for 120,000 but despite site managers good reputation it was still conditional on the local authorities being satisfied with the arrangements. One major hurdle that had to be overcome was the Police bill of £60,000 which was based on 450 officers for the potential attendance range, 75-120,000. With neither side willing to budge nine days before the Festival the organisers took the Police to court. Though the Judge sympathised with the cause the police won on points of law. Without police cover the licence was invalid so the following day a short notice meeting was held with the Council the outcome of which was that the licence would be granted if the Police costs were paid in advance. By this point it seemed attendance would be below 75,000 so the cost would be only £30,000 plus toilet facilities marquees and food and £7,000 worth of motorway signs for a proposed contraflow system. In the end cones alone were used so I assume the cost was just £30,000. Another stricture was that advance sales were limited to 105,000 before the festival would officially be 'sold out'. Tickets would still be available on the day though to accommodate fans that turned up anyway. This was all academic on the day as the final attendance was around the 75,000 mark. A drinks licence wasn't granted so the audience was free to bring whatever quantity they felt appropriate with them. We didn't realise this and brought none so it was a dry day in one respect. Needless to say this resulted in a huge number of bottles being used as urinals before being 'emptied' care of a quick fling to elsewhere in the audience. Interestingly the book claims a ticket price of £14 - the 'on the day' cost as advertised on posters - though the actual advance tickets had a face value of only £12.50. 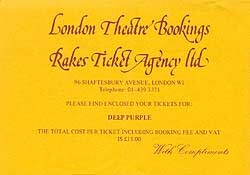 Of course most people bought them via mail order and/or a booking agent (there was no Internet then) so the cost was actually 20% more, £15, as the compliment slip shows. Another interesting comment about the tickets made in 'Knebworth Rock Festivals' was "advertisements and posters read 'No camping, no bottles, no cameras, no tapes etc'. I felt like adding 'no fun'. It was a bad omen, I thought, and sounded negative." I'm surprised by the 'no camping' section as there were, as Chryssie went on to mention, camping facilities and a communal tent was advertised as that is the option our party decided to take. Knebworth House now has a website that has a short feature on the 80s festivals plus to find out more about the history of the festival the owners have a gift shop website which used to sell copies of the useful reference book 'Knebworth Rock Festivals', by Chryssie Lytton Cobbold, November 1985. It appears no longer to be listed so I assume it has now sold out. My copy of the book provided most of the information on the page. If you do find a copy I'd suggest buying it as it has some great photos from the various festivals. From here on I take in the details of the trip to Knebworth and Ian Gillan wandering among the fans before reviewing the Deep Purple set (with others to follow in time). . If you would like to remind me af anything I've missed email me or sign the guestbook..